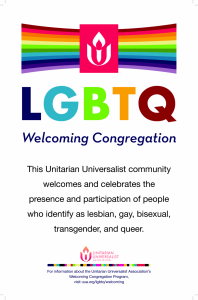 For our children and youth’s religious education program, we envision a welcoming, safe, and exciting environment in which young people develop a rooted Unitarian Universalist identity and sense of community along with a personally meaningful, vibrant spirituality. Our mission is to engage children and youth in fun and meaningful activities that help them develop a positive religious identity, an ethical approach to life, a personal spirituality, skills to live in a world of religious diversity, and a sense of interconnectedness with all people and the entire universe. to work for peace, social justice, and eco-justice in our world.